(8/15/12) The Space Studies Board of the National Research Council (NRC) is pleased to announce the release of a pre-publication version of the report, “Solar and Space Physics: A Science for a Technological Society.” The report, authored by the NRC Committee on a Decadal Strategy for Solar and Space Physics (Heliophysics), is a broadly-based assessment of the scientific priorities of the U.S. solar and space physics research enterprise for the period 2013-2022. Requested by NASA and the National Science Foundation, this “decadal survey” follows the NRC’s previous survey in solar and space physics, “The Sun to the Earth--and Beyond: A Decadal Research Strategy in Solar and Space Physics,” which was completed in 2002 and published in final form in 2003. The National Research Council is hosted a public release of this report on August 15, at 1:00 pm EDT in room 100 of the Keck Center at 500 Fifth St. NW, Washington, DC. The Report in Brief is availble for viewing. Develop an integrated research strategy that will present means to address these targets. The consequences of solar variability on the atmospheres and surfaces of other bodies in solar system, and the physics associated with the magnetospheres, ionospheres, thermospheres, mesospheres, and upper atmospheres of the Earth and other solar system bodies. The committee report will reflect an awareness of the science and space mission plans and priorities of potential industry, international, and U.S. agency partners and identify opportunities for cooperation and possibilities for growth or expansion. The survey will solicit and aggregate inputs from across the solar and space physics community via town hall meetings, sessions at professional meetings, and the solicitation of white papers. Read the full Statement of Task in PDF. The 18-member steering committee, as shown below, is supported by 3 discipline-oriented 15-member study panels. The steering committee is expected to hold five meetings between summer 2010 and fall 2011, and each panel is expected to hold three meetings between summer 2010 and spring 2011. Members of the steering committee and each of the panels were appointed through the customary processes established by the NRC. It is anticipated that reports from the panels will be incorporated in the final report of the survey's steering committee. In addition, there are five informal working groups that are populated with several NRC-appointed committee members and other volunteers from the community. Working groups are not appointed as committees of the NRC. Find out more information about the working groups. As described in more detail in the statement of task, NASA has asked the survey committee to prioritize science targets, match these targets to notional missions, and work with an independent contractor for a cost and technical evaluation of the notional missions. We invite community members to write a concept paper (e.g., mission or extended mission, observation, theory, or modeling activity) that promises to advance an existing or new scientific objective, contribute to fundamental understanding of the Sun-Earth/planetary system, and/or facilitate the connection between science and societal needs (e.g., improvements in space weather prediction). 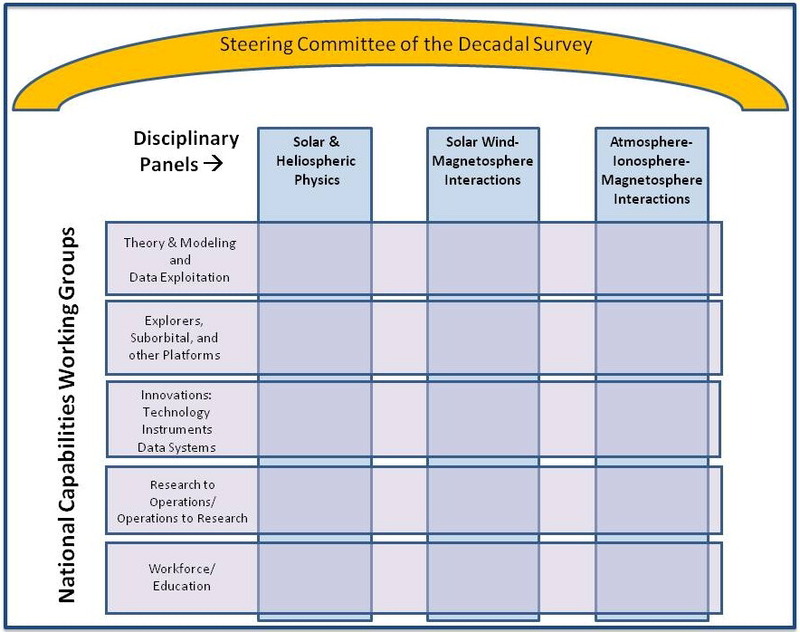 Read the Request for Information for the Solar and Space Physics Decadal Survey. The ideas and concepts received will be reviewed by one or more of the Survey’s study panels. Based on their potential to contribute to the research priorities established by the panels, one or more of the concepts may undergo more detailed technical and cost assessments. Panel recommendations and the contractor’s technical and cost assessments will be provided to the decadal survey steering committee, which is charged with writing a final report that includes targeted recommendations for the agencies. If anyone from the research community has comments or questions related to the study, you may send a message to heliophysics_decadal@nas.edu.